Whether it’s a smelly durian fruit, a sacred amulet, or even fresh livestock you’re seeking, there is a good chance you'll find it in Thailand's street markets. 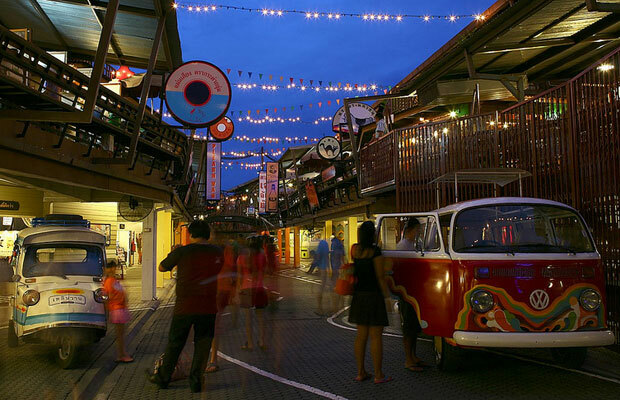 If you're planning a trip, pay a visit to any of these for a unique shopping experience. Perhaps Thailand’s most famous market, Damnoen Saduak is the one you’ll most likely find in the Thai guidebooks – because it floats. Full of wooden boats, clogged traffic, loud bargaining, and wild smells, all often coupled with heavy monsoon rains, this market on the water is a sensory (and olfactory) overload. However, don’t let its popularity dissuade you from a visit: While it does tend to get packed with tourists seeking photo opportunities and affordable fruits, spices, noodle soups, and vegetables, if you go early in the morning (between 8–10am), you’ll be able to get a feel for the rambunctious flavor of the market while not having to battle crowds to do it. Less than 50 miles from the country’s capital, it's the best place outside of Bangkok to get any of Thailand’s unmistakable flavors. Whether you’re seeking traditional noodle soup (less than $1), fruits like rose apples, rambutans, longons, and bananas, sweet and savory pastries, or steamed rice and meat in banana leaves, there is no smell or taste that Damnoen Saduak doesn’t offer. Tip: If you’re into cooking, don’t forget to peruse the non-floating part of the market along the riverwalk. In a small spice kiosk, I found a seller offering bundles of saffron for 1 baht (about 3 cents). Note: You can generally bring spices back to the U.S. through customs, but some restrictions apply. How To Get There: Less than 50 miles from Bangkok, it’s easy to get to Damnoen Saduak by renting a car, taking the local bus from the Southern Bus Terminal (leaving every 40 minutes, costing about $1.56 one-way), or booking a tour through any one of Bangkok’s many local tour operators. This market’s location is far more interesting than the local fish and fruit you’ll find here: it literally sits on a railroad. In 1905, long after the popular marketplace had become a spot for locals to buy their fresh meats and fish, city officials decided to plan a railway that would run straight through the direct line of market traffic. Instead of moving to a more convenient, and perhaps less messy, spot, the sellers decided to stay put, and thus continued the Mae Klong Market. For over 100 years, these market sellers have been unloading and reloading their wares on the train tracks at least seven times a day. Because the train runs at predictable times each day, the entire process is an incredible spectacle that the sellers have down to a science: A warning bell rings announcing an oncoming train, and with only 90 seconds, the sellers get to work rolling up tarps full of fish, stuffing vegetables under the tracks, piling up their goods, and pulling back the overhead tarp covering the narrow street in anticipation of the train. After it rolls through at 15 mph, narrowly missing almost everything in its path, the sellers are back to work, unrolling everything all over again. 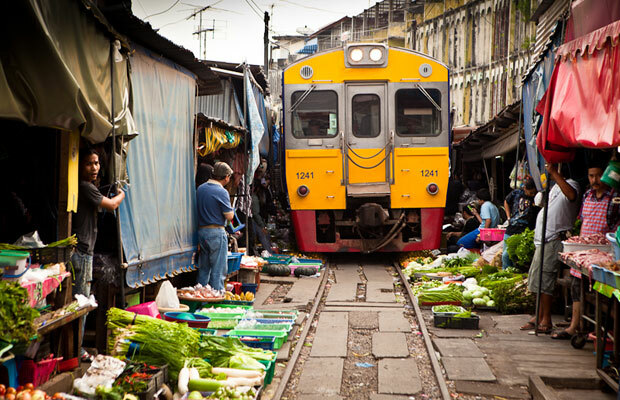 How To Get There: Also close to Bangkok, Mae Klong is only 37 miles from the capital. While there’s no direct bus route, you can rent a car, take a taxi, or hire a driver to take you for the day. Imagine a contemporary Thai night market modeled after one from the 1960s, and you’ll have the nostalgic amalgamation of Plearn Wan Vintage Village. Even the unusual name, which is a playful meshing of the English words "play" and "learn" and the Thai word for "yesterday," reflects the vintage village's commitment to immersing both locals and visitors in Thai history in a respectful and playful way. Whether or not you're a history buff, don’t let the more traditional night markets along the main roads distract you from a visit to the "living museum" in this sleepy beach town on the Malay peninsula – the two-story open-air wooden platform complex is strung up with blinking lights, old gas station pumps, statues of 1960s pop culture and cartoon icons, and soft 1960s Thai music playing from loudspeakers. For the Thai people, Plearn Wan is a testament to the past, a place where families can come and remember what market life was like in the middle of the 20th century. For visitors, Plearn Wan hopes to inspire both a critical understanding of Thailand's past and an appreciation for an older model of doing business – local vendors and artisans are encouraged to come and set up shop at night so that they can safely and comfortably sell their products and services to pedestrians. Come early, and you'll have first dibs on the fresh ice cream cones, retro fashion shops, LP records, vintage scarf and tapestry boutiques, souvenir t-shirts, fish spas. Stay late, and you can even catch one of the classic movies playing in Nang Klang Plaeng, an open-air theater. And if you're lucky, and you might even spot the man who notoriously and deftly fashions nam tan pan (local sweet candy) into tiny animals for children. How To Get There: Hua Hin is one of Thailand’s famed beach resort towns, located in the northern part of the Malay Peninsula (about 100 miles south of Bangkok). Once in Hua Hin, you’ll find the market on Petchkasem Road between Soi Hua Hin 30 and 40. Luckily, the market is clearly marked with a large sign hanging over the entrance. It is open until 11pm. If summoning a wild night of love or protecting yourself from a sworn enemy is on your list of things to purchase in Thailand, the Amulet Market is absolutely the place to go. Even if you’re not looking to help you ward off evil or bring love, the experience itself is worth the trip. 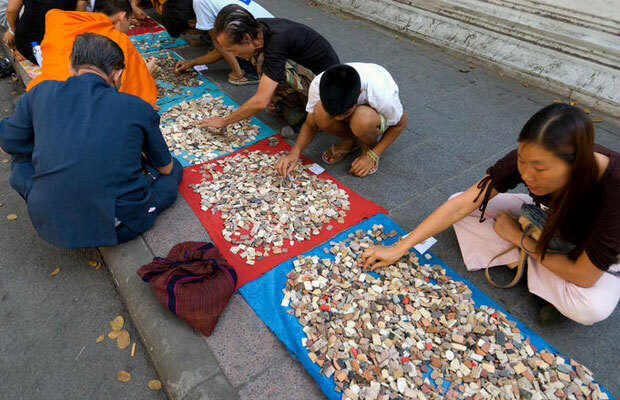 Every Sunday, hundreds of Buddhists and other spiritual seekers hoping to buy amulets, statues, or trinkets kneel down with magnifying glasses and peruse the many blankets laid out on the ground in search of the perfect charm or talisman for what ails them. Most, if not all, of the sellers will be able to tell you the magic that each talisman offers, whether it be to help find love, get engaged, pass a test, cure an illness, keep insects out of rice fields, or even ward off an ex-lover. In true tourist fashion, I picked up a gold replica of a sitting Buddha to bring me good luck. He now sits on my writing desk. How To Get There: The Amulet Market is in Bangkok, adjacent to Wat Mahathat between Maharat Road and the river. Sundays are the best – and busiest – day to go. While it’s likely you won’t be here to actually compare prices for a locally raised cow or live buffalo, you can buy pretty much any houseware item, trinket, furniture, or motorcycle imaginable here. You can buy roosters, cows, and buffalo too, but the really interesting items to me are not the farm animals for sale but instead the antique and second-hand items sold by rural Thai families. 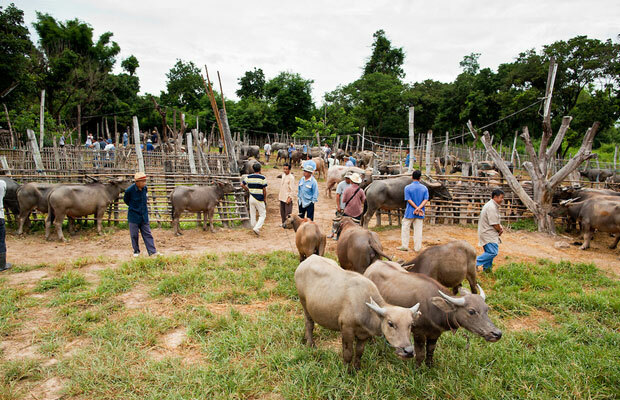 Starting very early on Saturday mornings and having run for decades as a central area for animal trading, the Water Buffalo Market has turned into a second-hand bartering fest. It’s a unique sight you won’t see in most street markets, for although the art of bartering is definitely a Thai specialty (and one they enjoy immensely), this isn’t a market for tourist souvenirs or Buddha statues – this is the real deal. Basically, this place sells what loosely translates from Thai to English as "everything from toothpicks to warships." How To Get There: This market is about 15 miles south of Chiang Mai and is best reached by car. You should get here before 7am if possible, as most bartering, bargaining, and final sales will have happened by then. A special thanks to Thai Airways and the Tourism Authority of Thailand for graciously sponsoring this trip and introducing me to so many incredible markets.